Click here for Petitions (Step 2 - Compose Your Petition). The Reference Name that you selected in the “create a new action” box will appear in this field. This field creates the "headline" in large text at the top of the end-user page (the page your supporters will see). Typically, this is used to briefly describe the purpose of the action. This text appears on the end-user page, and explains to your supporters why they should take action. The text appears below the title on the end-user page, but above the field containing the actual campaign letter. You can lay out this text block very simply or elaborately. If you want to, you can add images, text styling, hyperlinks and other design features using either code or the embedded WYSIWYG editor. Do not paste your action description text from MS Word. The page footer text appears below the form fields where supporters enter their personal information. It is generally used for either additional explanatory text about the page or identity information about your organization. To brand your page appropriately, choose a web template by clicking on the appropriate thumbnail. This will act as a wrapper for the page's entire content. If you don't choose a specific template, your Default Template will be used. Press “ Save” and proceed to the next step. Multi-Content actions differ from normal Targeted actions in that you can create several different messages, each targeted to different recipients. This allows your supporters to send finely targeted messages – such as a "thank and spank" (in which the message varies with whether the legislator voted for or against your cause), or different messages crafted to different versions of legislation in the House and the Senate. Under “Create your first set of content” enter a “set name.” This is an internal name that will help you match this content to the appropriate target(s). This may be something like “Thank you for sponsoring,” or “Judiciary Committee message,” or whatever best distinguishes the content of this message from others that you will create in this action. Click “add” to get started. This is the meat and potatoes of the multi-content action tool. Clicking this link will add a new content set which you can then set up in addition to you first/primary content set. After clicking the "Add another content set..." link, you'll be prompted to name the content set. Don't gloss over this, as the name you give the content set will be visible by your supporters. 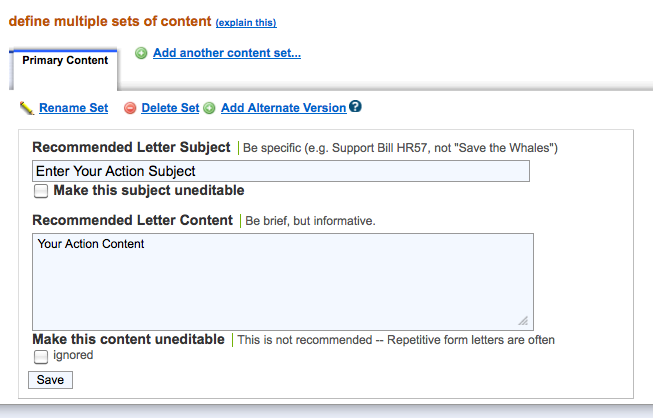 After you've added your content set, you'll see a new tab next to your previous content set, and you'll then be able to add your actual letter content. Your default content set is named "Primary Content", but you can easily change this (and the name of any other content sets) by clicking Rename Set. You'll make your changes to the name and then click the "Update Content" button. Optionally, you can create multiple different letters that will be presented randomly to your supporters. You can create a "carousel" of multiple suggested subjects and messages by saving a message, then clicking the "Add Alternate Version" button a second, third, fourth, or any number of times, creating distinct versions of the same message. When multiple entries are associated with a single content block, Salsa will randomly pick one to display each time the page is loaded -- so different supporters will see (and send) different default messages. This assures that the messages being sent are not all completely identical in tone or content. This will appear as a header above the content on the user-facing page, but below the action description you created in Step 1. The recipient of the letter will see this subject header, so be specific. Be sure that this subject header is appropriate to the content set (e.g., a content set named “thanks for sponsoring” would have a subject header like “Thank You for Sponsoring H.R.977”). This will be the suggested content of the message. Ideally, this is relatively brief, maybe two or three paragraphs (especially if you intend to send fax messages). When you have completed all of the content sets, it’s time to select which targets are to receive which messages. Navigate to Step 4 - Who can act? Here you’ll select who will receive the message(s) you just created. To select a target set, select a "target type" from the pull-down menu on the left side of the "add a set of targets" box. 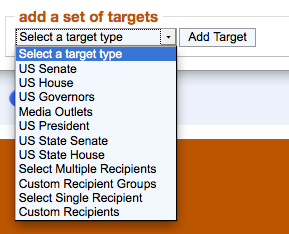 Select Multiple Recipients - This option presents the list of available custom targets to a supporter, and allows them to choose multiple targets to include. Custom Recipient Groups - This option allows you to present a supporter with a group of custom targets to contact at one time. Select Single Recipient - This option presents the list of available custom targets to a supporter, and allows them to choose one single target to include. *Only constituents of these targets can send messages to them, as determined by matching a supporter's address to legislative districts. "Black Hole" is normally used for testing purposes. 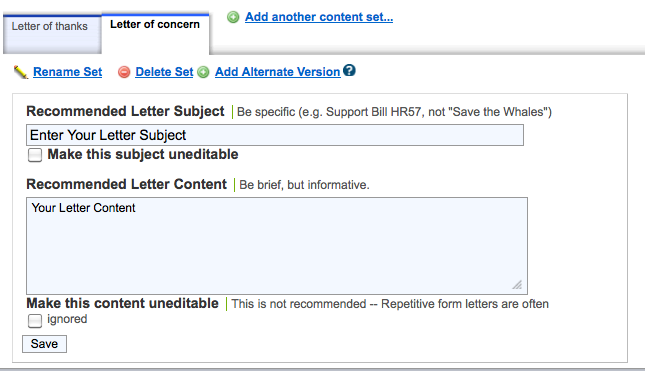 Selecting this option will cause the action to operate normally, but no emails or faxes will actually be sent. Be sure to change your action back to "Email" or "Fax" after testing, as there is no way to recover or resend messages your supporters send through an action set to "Black Hole". When using a Multi-Content action, you're explicitly planning to send different types of messages. You'll want to think through who should get which message. In a Multi-Content Targeted Action, a supporter attempting to take action might, according to the targeting instructions, be given no matches, one match, two matches, or many matches – and they'll simply be presented with a message for each different recipient they match. By default, the targets you add to your action will be set to Auto-Targeting, which means that the individual target (within the target type group you have selected) will be chosen based on the address information provided by your supporters. For example, for an action targeting the US House, entering address information with a zip code of 90212 would bring up Representative Henry Waxman (as of Nov 2011, that is!). Please note that this screen will provide different options based on the target type you are filtering. The above screenshot is for the US House type. At this point, you can select what criteria you would like to filter on, and then make as many selections in the checkboxes next to each target. If you do a second search based on other criteria, your previous selections will be maintained. Step 4 - Who can act? Use the options in this tab to limit the action to specific states or federal districts. Who is allowed to take action? If you are not adding any restrictions, choose the default "Everyone" option. Otherwise, to add restrictions, choose "Only people in the following areas" from the drop-down menu. The text in this box (which also accepts HTML) appears to a supporter who cannot take action due to the above restrictions. 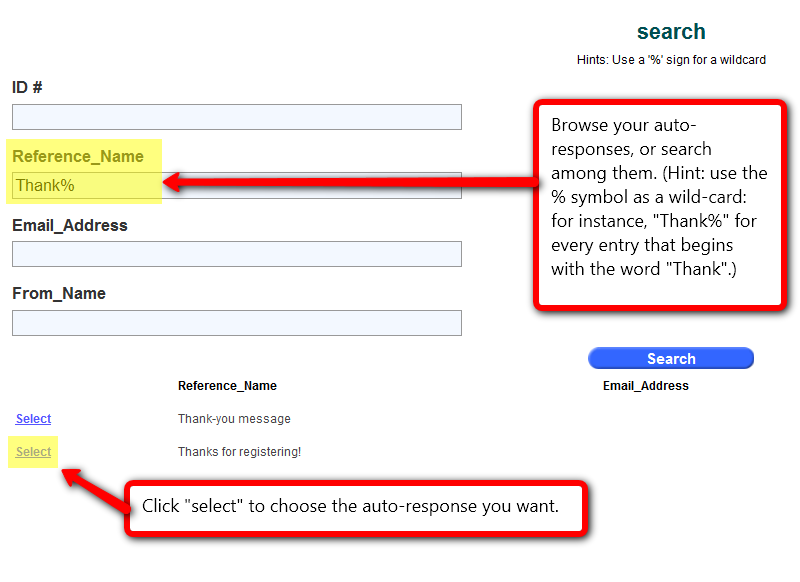 This tab allows you to define what information you gather from your supporters when they "sign" the petition. It also allows you to assign your supporters to groups. This section allows you to set the fields that end-user supporters will be asked to fill out, and (via the "Required" checkboxes beside each field) require that some or all of the requested information be provided before the submission is accepted by Salsa (users will see an error message like "Please provide the following information," when they try to submit an incomplete form). To add an additional field, click the "another field" link, and choose the field from the pull-down menu. To eliminate a field you've already selected, click the "-" button next to that field. Click the "Use Field Order Shown Below" box, and save. Change the order of your saved fields by click the drag handle next to any field, and holding down your mouse button as you move it up or down the field list. When the fields are ordered to your liking, click "save". Groups are a way of tracking subsets of your supporters who meet certain criteria that set them apart from the rest of the list. You can create as many groups as you like, and each group can contain as many of your supporters as you would like to include. Groups can be used as search criteria for queries and for targeting email messages. Under “Add to these Groups” click “Add a Group.” Then click the magnifier icon. A pop-up list of your groups will appear, and you can click “Select” to choose which group end-user supporters on your action page will be automatically added to. Continue this process if you want to choose multiple groups. Next you can select one or more “Optional Groups” as you would an automatic group (in the “Add to these Groups” option). A checkbox will appear on the user-facing page for each optional group that you select, giving supporters a choice of whether to add themselves to groups. Many organizations use Optional Groups to invite supporters to receive one or more newsletters. This tab allows you to define what occurs after a user has successfully signed a petition. What do you want to display on success? Display Thank You Text - The supporter will not be redirected to a new page, but will see the message entered in the Thank You Text box below. Redirect to a Tell a Friend Page - This option will provide you with a list of existing Tell a Friend pages to choose as your redirect page. Alternatively, you can click the "Create Tell-a-Friend" link to make a TAF page on the fly. Redirect to a Donation Page - This option will provide you with a list of existing Donation pages to choose as your redirect page. Redirect to Another Page - This option will allow you to enter any URL as your redirect page. Make sure to include http:// at the beginning of the URL. “Add a new response” creates a brand-new Autoresponse on the fly. • Click "Add a new response"
• Enter a name and email address who should appear on the "From" line of the email when the recipient reads it, as well as the content of the message itself. • Click "Add an existing response"
You've reached the end! Go back to the Actions 3 home page. This page will allow you to set several optional or additional configurations with your action page. 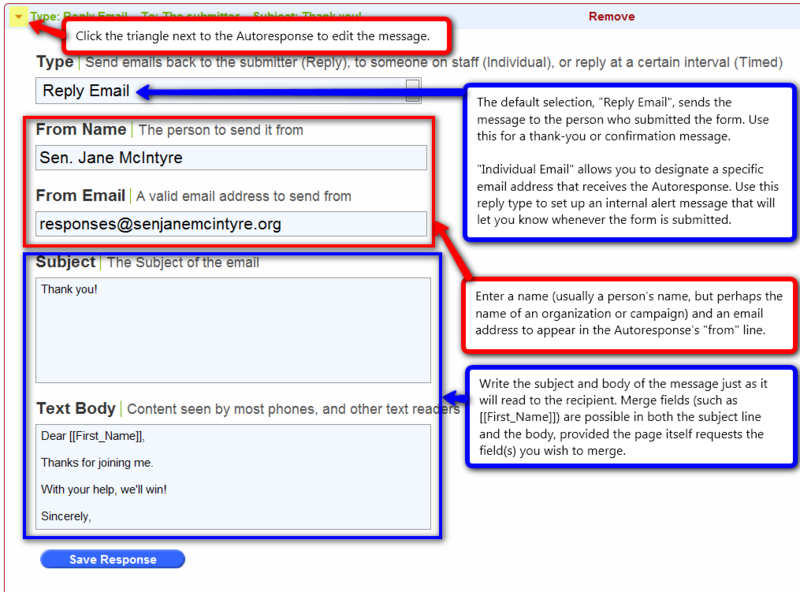 To limit the number of e-mails that can be sent through the action, set the maximum number of e-mails to a number where you would like them to stop. You may want to use this as a tactical courtesy when the action is directed to a target (such as a custom target or a local official) not accustomed to receiving large numbers of advocacy e-mails -- pick a number high enough to make your point and low enough to avoid alienating the recipient. Leaving the number at 0 will allow an unlimited number of e-mails to be sent. To limit the number of faxes that can be sent through the action (and thus the amount you can be charged for fax service), set the maximum number of faxes to a number where you would like them to stop. By default, this number is set to zero: you must enter a larger figure to conduct a faxing action. There may be an additional cost for faxing – check with your provider. DemocracyInAction and Wired For Change currently bill $0.10 per page (there may be more than one page per action for long messages) for domestic faxing and actual cost (which can range well above $1 per page) for international faxing. If there is a need to disable the action entirely, you can simply select "Inactive" from the drop-down list. I finished creating an alert, how do I send out to our supporters? 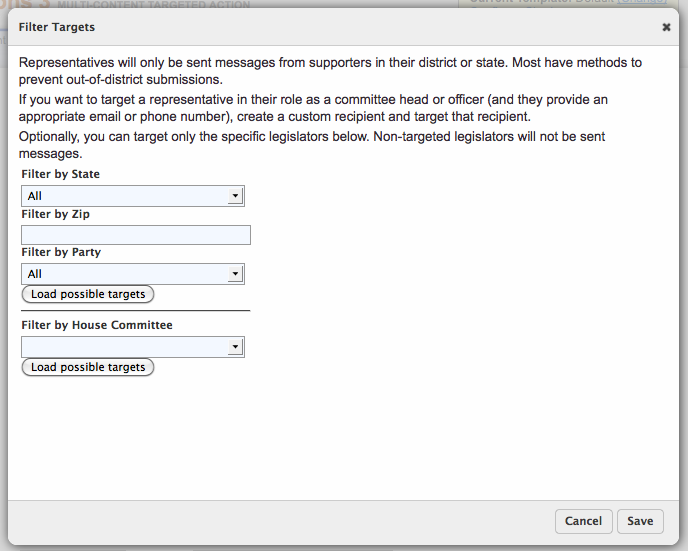 Hi team, I'd like to send a multi-content action customized to each State Rep that autotargets based on our supporter's zip code - a little different than what you describe here since they're all within one autotarget classification, but I do want emails coming from their own constituents - not our full CA list. Is this an option? Between the Who Can Act step and the possibilities of targeting your emails based on Legislative District, this should be achievable. Given the uniqueness of your situation, it'd be best to take this discussion to other channels - can you please email support@salsalabs.com with more information? Thanks! That text is not editable. Let's say we're restricting an action to members of the NY State Senate, with a thank option for bill sponsors. and another to ask people to sign on to sponsor our bill. This action would be restricted to NYS residents. * If I select all of the people to THANK through filtering, then create a second target group for the people to ASK TO SPONSOR, do I have to manually create the second group of people who have not signed on, or do they get the second message automatically? * Is there a way to save or transfer target sets from one action to the next? Our list of co-sponsors for our bill is growing, but there is a sizeable group of people who have signed on and it would be good to be able to build from that group the next time we do an action. Dan, you will have to create both the thank you group and the ask to sponsor group separately (aka whoever isn't chosen in one group won't automatically get the other message). There's not currently a way to save or transfer targets specifically from one action to the next, though there is the option of copying/recycling a previous action page as that does bring over the targets. You'll just want to make sure that you update everything in the content and make sure you have the correct follow-up emails, etc. selected for the new action page. Thanks!